Sing it out. You want to know if The Voice TV show has been cancelled or renewed for a 16th season on NBC? The television vulture is watching all the latest cancellation and renewal news, so this page is the place to track the status of The Voice season 16. Bookmark it, or subscribe for the latest updates. Remember, the television vulture is watching your shows. Are you? Hosted by Carson Daly, The Voice TV show is singing competition. It typically airs twice weekly on NBC — on Monday and Tuesday nights. Kelly Clarkson, Jennifer Hudson, Adam Levine and Blake Shelton return to coach in season 15. Advisors this time out include Thomas Rhett (Team Clarkson), Halsey (Team Hudson), Ceelo Green (Team Levine), and Keith Urban (Team Shelton). The competition is divided into five stages: blind auditions, battle rounds, knockouts, playoffs, and live performances. The Monday episodes of 15th season of The Voice averaged a 1.72 rating in the 18-49 year old demographic and 9.25 million viewers. Compared to the Monday episodes of the 13th season (Fall 2017), that’s down by 18% in the demo and down by 9% in viewers. The Tuesday episodes of the 15th season of The Voice averaged a 1.66 rating in the 18-49 year old demographic and 9.11 million viewers. Compared to the Tuesday episodes of the 13th season (Fall 2017), that’s down by 17% in the demo and down by 9% in viewers. Find out how The Voice stacks up against other NBC TV shows. The Voice has been renewed for a 16th season which will debut February 25, 2018. Stay tuned for further updates. Will NBC cancel or renew The Voice for season 16? Although the network didn’t issue an official 16th season renewal release, it has already announced John Legend will serve as a coach during the Spring 2019 cycle. I’ll update this page with breaking developments. Subscribe for The Voice cancellation or renewal alerts. Find more of The Voice TV series news or other NBC TV show news. What do you think? Are you happy The Voice TV series seems to be renewed for a 16th season? How would you feel if NBC cancelled this TV show, instead? 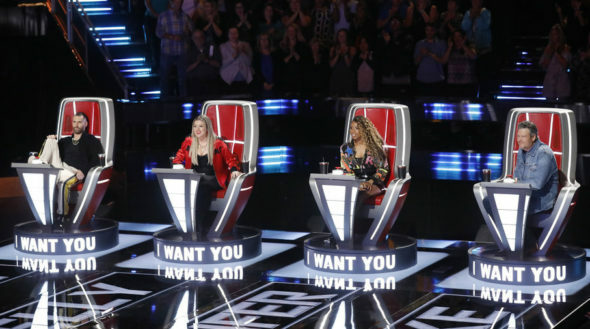 The Voiceon NBC: Cancelled or Renewed for Season 17? The Voice: Is the NBC TV Show Cancelled or Renewed for Season 13?